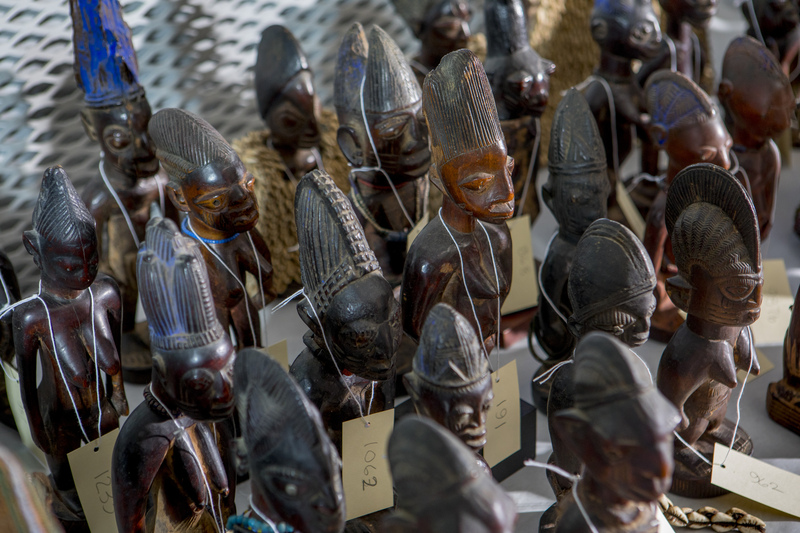 WORKING WITH AN IMPRESSIVE COLLECTION OF AFRICAN ART, STUDENT CURATORS CREATE AN EXHIBITION THAT EXPLORES AUTHENTICITY AND NATIONALITY. 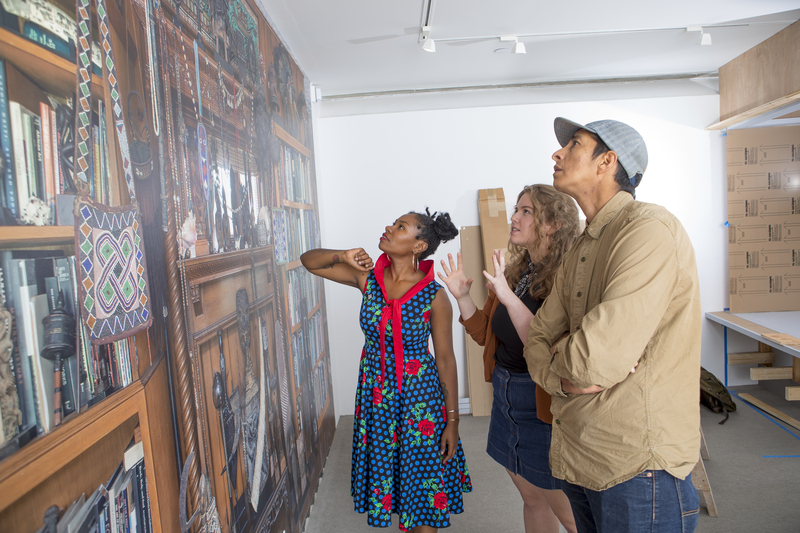 Student curators regard a photo mural, part of the exhibition 5 Takes on African Art: Exploring the Charles Derby Collection. From left: Kiara Hll, Elizabeth Upenieks, and Vick Quezada. The show will be on view at the University Museum of Contemporary Art through the spring semester. When you visit a museum gallery, do you take what you’re seeing for granted and simply look at the objects? Or are you aware that the exhibition you’re moving through is a work of art in itself, painstakingly selected and arranged by curators to create a cumulative effect? The University Museum of Contemporary Art’s annual Curatorial Fellowship Exhibition, now in its 10th year, gives graduate students the opportunity to extend their wings as curator-creators. 5 Takes on African Art: Exploring the Charles Derby Collection empowered five different curators—four graduate students, plus Imo Imeh, professor of African art at Westfield State University—to go through Derby’s vast personal collection of artifacts to select pieces that represent their own “take” on issues of cultural hybridity, womanhood, authenticity, colonialism, and repatriation. My lens was, what stories can I tell, what narratives can I bring out? Each curator was given a room, with the rooms existing in conversation with each other. The entire exhibition is “hugged,” in the words of curator Kiara Hill, by the flags of 42 African nations, drained of their colors and rendered only with their black-and-white graphic elements, by contemporary artist Fred Wilson. Wilson is known for his striking visual inquiries into ways museums present and tacitly enforce a civilization’s values. Ere ibeji twin effigies from the Yoruba people await installation. Hill relates her experience of beholding the collection, “When I first walked into Charlie’s house, it was like an amusement park for me—there were so many things around!” Hill chose to focus her selections on the life experiences of black women. She explains, “My lens was, what stories can I tell, what narratives can I bring out? What would help me remedy this bifurcated identity that I have as an African American woman?” Curator Vick Quezada chose to home in on material culture—the life of everyday objects moved from their point of origin, and how they’re now used and valued differently from the intent of their creation. And curator Elizabeth Upenieks explored the idea of authenticity. For instance, what makes one object—say, a ceremonial stool—“authentic,” yet another identical object “tourist art”? At the next installation you visit, notice how people move through the gallery. Notice how works are juxtaposed and how different works interact through color and theme. Your experience is the product of much deliberation on the part of the curator.